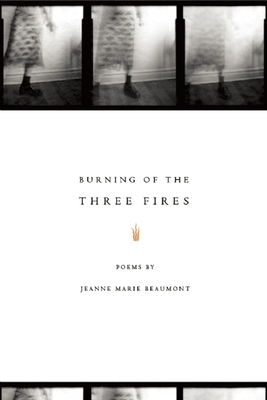 Burning of the Three Fires shows Jeanne Marie Beaumont using her characteristic variety of techniques: dramatic monologues, lists, prose poems, object poems, and ekphrasis, to which she adds biography, elegy, and rites. This book takes a multifaceted look at womanhood: there are dolls, historic and modern girlhoods, mythic retellings of characters from Goldilocks to the Bride of Frankenstein, emotionally charged domestic trinkets, and even a conversation with Sylvia Plath conducted via a Magic 8- Ball. Jeanne Marie Beaumont is the author of Curious Conduct (BOA Editions, Ltd., 2004) and the National Poetry Series-winning book Placebo Effects. She lives in New York City. Jeanne Marie Beaumont: Jeanne Marie Beaumont (www.jeannemariebeaumont.com)is the author of Curious Conduct, published by BOA Editions in 2004, and Placebo Effects, selected by William Matthews as a winner in the National Poetry Series and published by Norton in 1997. With Claudia Carlson she coedited the anthology The Poets' Grimm: 20th Century Poems from Grimm Fairy Tales. Her poems have been published in numerous anthologies and magazines including Barrow Street, Court Green, Denver Quarterly, Good Poems for Hard Times, LIT, The Manhattan Review, The Nation, Poetry Northwest, Poetry Daily, The Year's Best Fantasy and Horror 2007, World Literature Today, and others. Her poem "Afraid So" was made into a short film by award-winning filmmaker Jay Rosenblatt which has been shown at over two dozen international festivals, including the TriBeCa Film Festival and the 2008 Split This Rock Poetry Festival; it won 2nd prize at the Black Maria Film Festival, among other awards. She has taught at Rutgers University and the Frost Place in Franconia, NH, where she is now the Director of the annual Frost Place Advanced Seminar. She currently teaches at the Unterberg Poetry Center of the 92nd St. Y and in the Stonecoast low-residency MFA program of the University of Southern Maine. A native of Pennsylvania, she has made her home in Manhattan since 1983. "Beaumont places her words on the page with the care of a curator arranging artifacts in a display case." "Beaumont may possibly be the bright side of Anne Sexton or Sylvia Plath…Reading Beaumont, one concludes that there is a principle by which a good poem is its own exhilaration." "Eclectic, quirky, often dazzling, Burning of the Three Fires charms and seduces in its ability to shift, with impressive ease, between the playful and the sublime."